I was able to hit two food trucks last week! 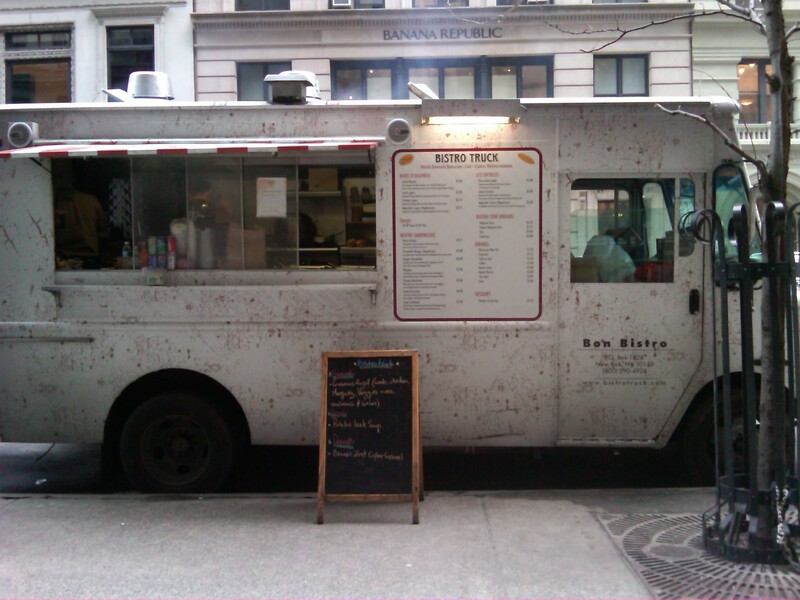 I was doing some shopping down in Chelsea and I noticed the Bistro Truck. I always see this guy around but never stop by. 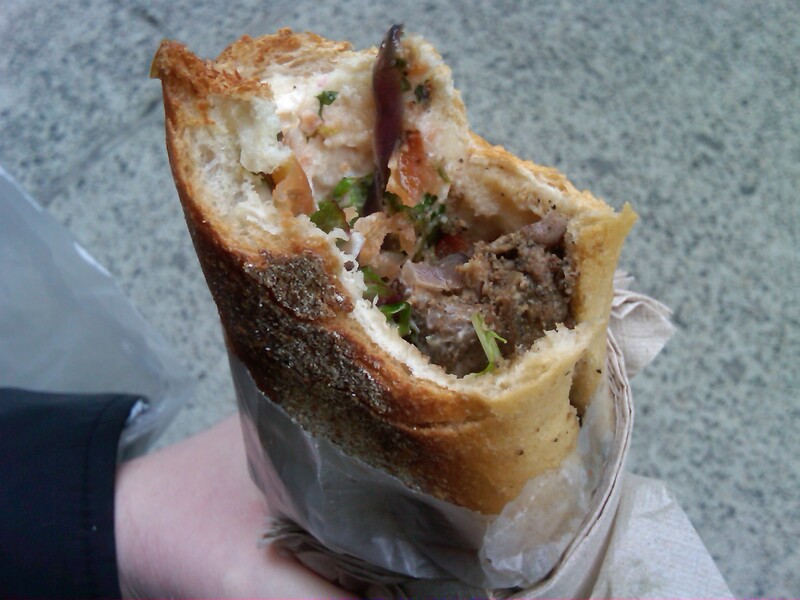 The concept for the truck is an affordable Bistro menu with a Moroccan-Mediterranean influence. While I didn’t want to put too much of a halt to my shopping mission I decided to get the lamb brochette- marinated and grilled with roasted tomatoes, and carmelized onion charmoula. Charmoula is marinade popular in Algerian, Moroccan and Tunisian cooking. The mixture consists of herbs, oil, lemon juice, pickled lemons, garlic, cumin, and salt. Pretty much a party in your mouth. I pulled up some wall and dove in with the hot dog vendor man eyeing me the whole time. Second was a rather large accomplishment the Jamaican Dutchy truck, a finalist in the 2009 Vendy Awards! An accomplishment in hitting a major mark on the truck route and also convincing my boyfriend, Scott thats it’s okay to eat out of SOME trucks on the side of the street in Manhattan. Not a local to street meat culture, he seemed to stereotype this cuisine with dirty water dogs. Blasphemy! 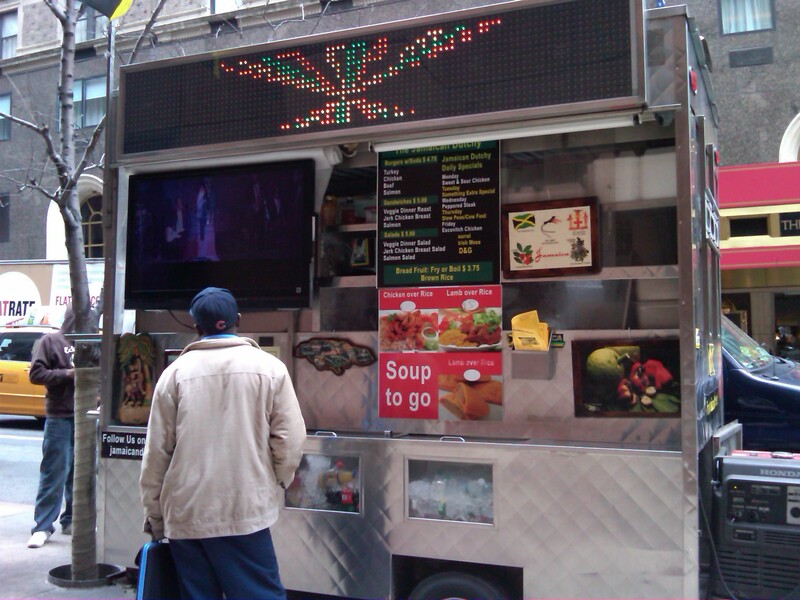 We walked up to 51st and 7th and spotted the little cart quietly nestled on the corner with neon lights and the muffled sounds of reggae music coming from a flat screen TV. We arrived just prior to the lunch hour rush. For all new comers, you order in the front, pick up in the back! 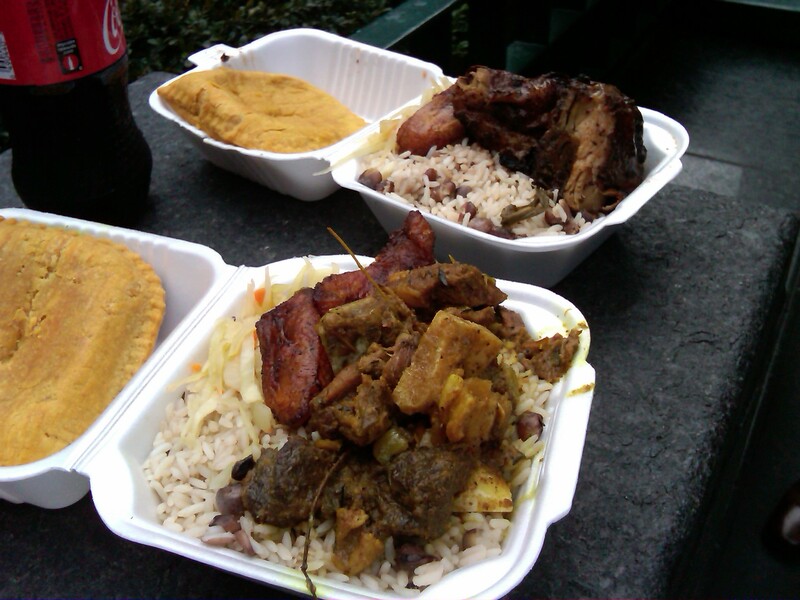 My dining partner and I shared the famous Jerk Chicken and Curry mini meal with rice, plantains and beans. And we of course got a Jamaican meat pie on the side! Excellent overall! Just watch out for the bones in the curry. And needless to say I made a believer out of him! Another great street meat is Rickshaw Dumpling Bar! Also can be found on Twitter @RickshawTruck. Parked in Hanover Square this afternoon.